Howie, Sacks and Henry is passionate about helping individuals who’ve been hurt by defective or faulty products. 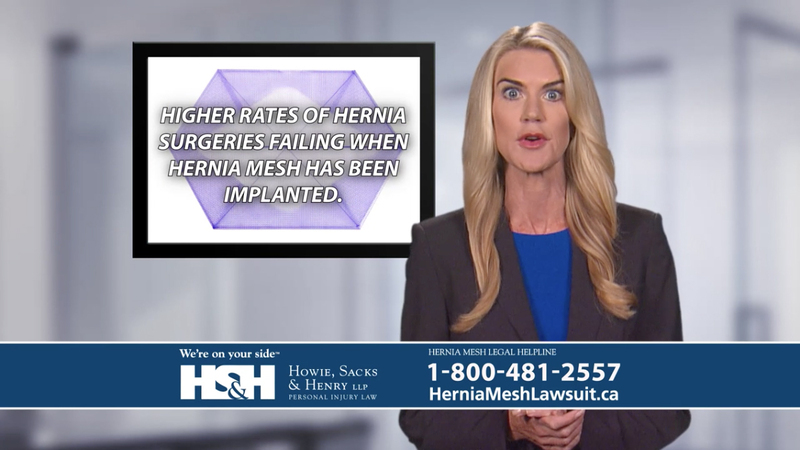 We launched www.herniameshlawsuit.ca to raise awareness of the dangers of defective or faulty hernia mesh. For example: Did you know that there are 100,000 hernia surgeries performed in Canada every year? With studies suggesting a 20% complication rate, this poses a significant threat to Canadian’s health. On Tuesday, November 21, 2017, the Legal Marketing Association (LMA) Eastern Canada held their Fifth Annual Your Honour Awards Gala. The night recognizes excellence in legal marketing by promoting projects and programs that provide valuable information for stakeholders. The Hernia Mesh Lawsuit in Canada site was awarded a Your Honour Award for Excellence in Communications – Niche Sites and Blogs. The campaign included a microsite, online and television advertising, informational blog posts, and a community support page on Facebook. Thank you to the Gala sponsors: Thomson Reuters Media Solutions Canada (publishers of Canadian Lawyer and Lexpert), Intergrate2Cloud and ZSA. Founded in 1985, LMA is the authority for legal marketing – a forum that brings together legal marketing and business development professionals from firms of all sizes, consultants and vendors, lawyers, and marketing students to share their collective knowledge. Suffering from serious complications (infections, wound reopening, chronic pain, bowel obstructions) due to a hernia mesh implant? Tell us your story.